Jorge Martin was born on January 29th, 1998, in Madrid, Spain. As soon as he learned to read, he became obsessed with books and magazines about motorcycle racing. Such was his passion that, at the age of six, his father, a former amateur rider, gave him his first mini-bike. Jorge Martin would take his first steps in competition in minimoto cups, claiming his first title in the “Alevin Minimotos Championship” in Madrid in 2008. It would be in 2012 that he debuted on the international stage, participating in the Red Bull MotoGP Rookies Cup. The following season, Martin would finish runner-up in the series. After two successful seasons adapting, in 2014 Jorge Martin was crowned champion of the Red Bull MotoGP Rookies Cup, with a total of six victories and four podiums. This opened the doors to the Moto3 World Championship the following season. In 2016, the young Spaniard took his first World Championship podium after finishing second in the Czech Republic Grand Prix. His first victory would arrive the following year, in 2017, at Valencia Grand Prix. That year he earned a total of eight podiums, including the victory in the last round, and nine pole positions, finishing fourth overall with 196 points. After a masterful season, in 2018 Jorge Martin won the Moto3 World Championship at the Malaysian Grand Prix, culminating a fantastic year in which he racked up a total of seven wins, three podiums and ten pole positions. The 2019 season will be his first in Moto2. 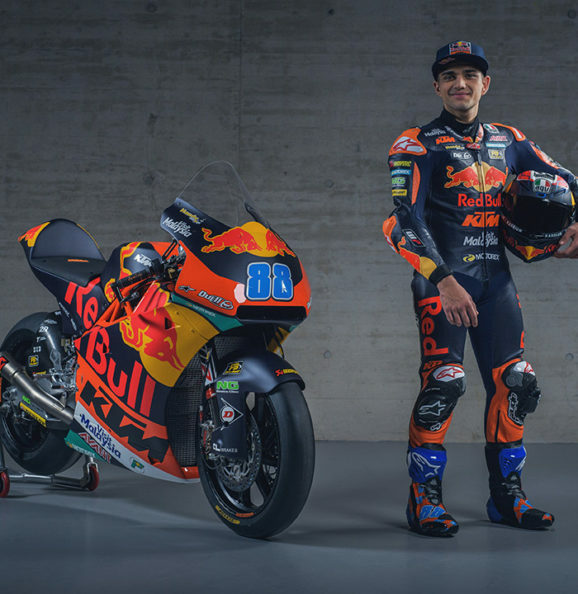 Thanks to the Red Bull KTM Ajo team, Jorge Martin makes the leap up to the intermediate class, in which he will seek to continue with his rapidly ascending and successful career.